Well made and worth the money, the Concept2 Model D with PM5 is high-performance exercise equipment that works perfectly, and is a joy to use. Really, this low-impact machine gives a complete cardiovascular and whole-body workout, as well as delivering high calorie-burning motion and engages all muscle groups; work arms, core and legs. 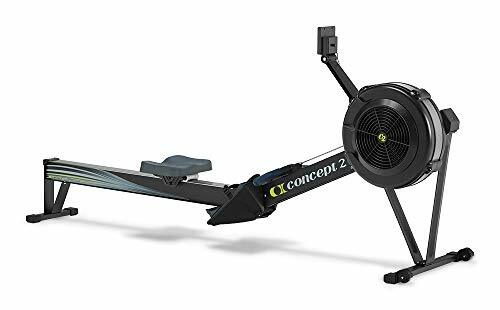 If you want the best of the best check out the Concept2 Model D with PM5 Performance Monitor Indoor Rower Rowing Machine Black. The Concept2 Model D is a super solid piece of exercise equipment that gives a rowing experience much-like a typical club machine. Everything about this product from its fit, feel and finish is built to a very high standard. Easily track performance data in real-time. The built-in Performance Monitor 5 gives high accuracy and self-calibrates for the most reliable solution to track your progress. Multiple workout options are available, such as intervals, distance and time. And all performance data is easy to read on the backlit LCD display. Stay motivated with the assistance of wireless technology that lets you connect this rowing machine to third-party fitness apps, as well as heart rate belts to benefit from the more in-depth monitoring. Workout intensity is easily controlled with help from a very responsive air-resistance flywheel that generates a smooth feel and controlled with an adjustable damper (1-10 levels). Built to fit virtually all users with a variety of adjustable or comfort inspired options like the ergonomic handle, adjustable footrests and 14-inch seat height. Plus, the user capacity is very generous at 500 lbs. Many other rowing machines are maxed out at 250 or 300 lbs. Enjoy complete ease in assembling, moving and storing. You only need to use eight screws in the entire setup process. A special screwdriver is packaged with the machine. Assemble time is approx 15/20 minutes. Mobility is great with the use of caster wheels. And this rowing machine easily splits into two pieces (no tools needed) to take up minimal space in storage. The typical storage floor space is 2 feet by 3 feet. The total footprint of the Concept2 Model D is 9 feet by 2 feet plus you will need to have an extra 1 or 2 feet to let your arms freely move at the side while performing the rowing action. The Concept2 Model D is a joy to use and very much like the machines used at local health clubs. In order to get a great all-round appreciation of the Concept2 Model D with PM5 Performance Monitor Rowing Machine lets take a look at the most talked about pros and cons related to this machine. Everything about the Concept2 Model D is solidly built to make sure it stands up to regular use. The noise of the rowing machine is certain to be a major concern for most buyers. Thankfully, this Concept2 model is very quiet in action. Easily adjust the tension of the flywheel to make the difficulty level low or high. A variety of rowing levels mean this machine can continue to offer the preferred level of difficulty even after seeing an improvement in fitness. Easy to place the rowing machine in the preferred place in the home without needing to have it located near an outlet for the electronics like the display to work. The Concept2 Model D is long, but still low to the ground and will not take a huge amount of space. While the seat is fairly comfortable, it does start to feel a little tough on the back area after a session that lasts 25-30 minutes or longer. A simple solution to improve the comfort is to introduce extra cushioning to the seat. A folded towel works fine. Alternatively, there are plenty of aftermarket cushions that will make the seat more comfortable. The foot strap isn’t the most appealing (a Velcro strap would be better) and may benefit from being a little wider for some users. Big in size, the Concept2 Model D has a long footprint (9 feet) which can limit its placement. Also, for taller users – at 6’1″ or more – the stroke may feel unnatural and too short. Overall, the Concept2 Model D with PM5 Performance Monitor Indoor Rower Rowing Machine is a solid product and well worth your money. The differences between the Concept2 Model D and rowing machines at the lower end of the market are enormous, so it pays to go with a quality rower. It sits at a great height and is well built with double-powder-coated metal surfaces to give many years of dependable performance. Yes, this rowing machine isn’t the cheapest, but you will get your money’s worth and get to truly appreciate the smooth and professional quality performance of this model. How long should I row on a rowing machine? How do you use a rowing machine? Some recommended products may use affiliate links. SportsRower.com is a participant in the Amazon Services LLC Associates Program, an affiliate advertising program designed to provide a means for sites to earn advertising fees by advertising and linking to Amazon.com. Amazon and the Amazon logo are trademarks of Amazon.com, Inc or its affiliates. Copyright 2018 by Sports Rower.